You are here: Home » United States » Atlanta » Prophetic dream warns of small nuclear bomb exploding about 3 miles NW of Atlanta. Prophetic dream warns of small nuclear bomb exploding about 3 miles NW of Atlanta. Today, another Z3er, Marcio Ferez Jr., received a similar dream, confirming what Ivette saw, as shown below. 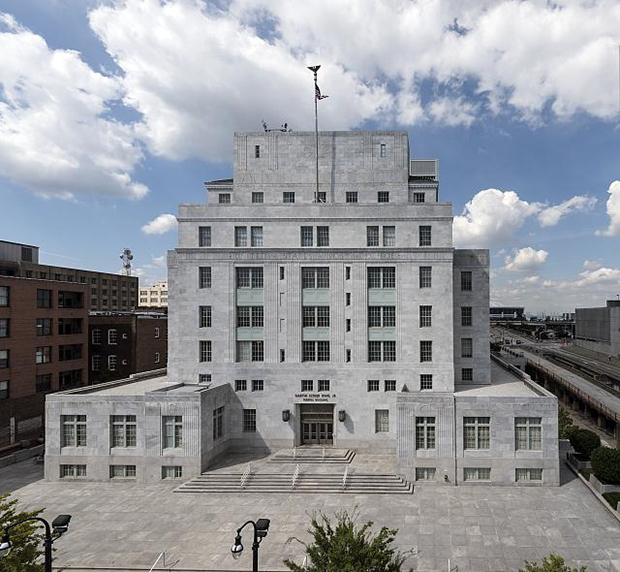 Today, after looking up on the internet and google maps, the building that looked very much like the one in my dream was the Martin Luther King Jr. Federal Building (shown above). The bus was parked on the front NE corner. The explosion was to the NW. That area has the Westside Reservoir Park and Maddox Park. False teaching and false prophecies are rampant in the Church today with many claiming these kinds of warnings are nothing but gloom and doom. They say we’re giving prophetic ministry a bad name by sharing these things. Sadly, millions are blindly believing their claims because they haven’t taken the time to study the Bible. If they did, they would see the God of the Bible has always given His people prophetic warnings of trouble, from Genesis to Revelation. Simply by studying the Bible, we can learn to recognize anyone making those claims, no matter how smooth their words, are nothing more than false teachers, false prophets, claiming to be wise counselors while in reality they are nothing more than hirelings seeking to promote themselves by tickling the ears of the undiscerning. The God of the Bible has always spoken to His people through prophetic dreams and visions, sometimes to warn us and other times to instruct and guide us. The Bible gives us everything we need to sort these things out, showing us examples so we understand His warnings are not necessarily predictions of what will happen, but what could happen if we continue on our current path without humbling ourselves in repentance before Him with many examples of God relenting of judgment when people repented after hearing His warnings. For example, Jonah was instructed by God to warn the people of Ninevah their city would be destroyed in 40 days, but it did not happen because they repented (Jonah 1-5). Even if our nation continues on our present course, it doesn’t mean these things will happen right away because no dates were revealed. In Ivette’s dream, she was driving a futuristic car, which is a clue telling us we still have more time. So, we should take these warnings seriously, but I think it would be a mistake for people living in the Atlanta area to assume they should start packing up and leaving. God does not expect us to be led by prophetic dreams given to other people because He has given us a far better way, being led directly by His Spirit (Romans 8:14). As always, the safest place is not found in any physical location, but in the unseen realm of the spirit, by being in right relationship with the one true God, the God of our Lord Jesus Christ, because He has promised to provide everything we need if we will make it our number one priority to come under His dominion in every area of our life (Matthew 6:33). Anyone willing to do that puts themselves in position to receive all God has promised, as shown in the scriptures listed below. The last two paragraphs were well explained James, Thank you…… And with the exception of the futuristic car……the thought came to me as the device would be blamed on NKorea, but in actuality it was of Russian origin. It’s hard to say, nevertheless, the advice given is sound as always……..seek God. Thank you Anne for a beautiful comment. God is Love and He shines in His people in a dark world. God is good to show his bride of the things to come and to confirm it by others, an article at Dave Hodges site the common sense show he talks of the UN takeover of America through the kigali principles and shows UN tanks parked in a empty lot in Atlanta Ga. The white futuristic car….speaks to me of the technology of the era we are living in…electric cars…futuristic driverless cars as well../however the car could represent a vehicle the father is supplying to hightail out of that city @ the time of destruction…?? Technocracy/Technology increasing @ a rapid rate…just as Daniel & John saw in the book of Revelation. The concept of the electric car has been around for some time, and is particularly important as the world becomes increasingly aware that fossil fuel supplies will not be around forever. The Kia Pop is one such solution and features a futuristic, instantly recognizable shape and design. It is also exceptionally lightweight, ensuring that the electric motor can travel for around 100 miles before it needs to be charged. It could be the perfect car for our increasingly congested, polluted cities, and if you want to see more about electric car innovations, be sure to watch the video at the bottom of the page! I agree Christine Chapman… I believe the futuristic car possibly represents the protection of the Lord, and the downloading of the wisdom of the Holy Spirit.